This 'diario' is for beginning Spanish learners or as a 'back-to-school' refresher for second year Spanish learners. The topics address central concepts for first year learners: Self, Body, Location, Culture/Country, Emotions, Conversation, Family, Future Self, Wants & Needs, Seasons, Holidays, Food, El Dia de Los Muertos (Day of the Dead), Places, Occupations. This download includes 34 journal entry pages of fun and engaging ideas, and four pages of useful terms and phrases to help the learners with each journal entry. The pages aren't numbered, so you can order them in any way you want, but I recommend cutting the printed page in half to create the journal with one entry per page. Students are encouraged to express their thoughts and ideas, using the terms and phrases, but to not get hung up on not knowing how to write what they want to. 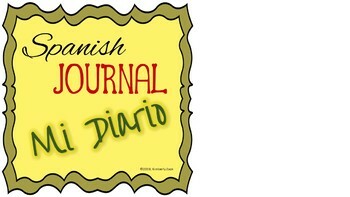 I hope this Spanish Journal will inspire your students.